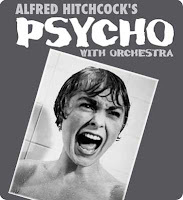 Today we rehearsed Psycho. The music was written by a well known film score composer, Bernard Herrmann. It is very creepy music, very interesting and dissonant at times. Then there are the sections with the pretty famous slasher music. Herrmann uses motives, chords and themes repeatedly; I'm sure that must be connected with various characters and/or moods in the film.I wish that I could see the screen. On some occasions, like when we played the music for Wizard of Oz last summer, I can look up when the violins have rests in the music. But for this performance, I am in back of the screen. I guess I will have to use my imagination and listen for the screaming! July 3 and 4 were great last week at Oregon Ridge. Absolutely perfect weather, nice big crowds, and I enjoyed our conductor, Damon Gupton, quite a bit. I think that was the first time we played the entire Tchaikovsky 1812 Overture at OR for a long time; how nice.